They will largely be afterthoughts, but two of the biggest plays made Saturday were tackles by cornerback Chris Milton and safety Isaiah Johnson. Milton tracked down Georgia running back Nick Chubb after he broke free down the left sideline in the first quarter - he eluded Johnson along the way - bringing him down at the 1-yard line. It would seem that we need to clear something up here. Ed. Note: Being Friday before we renew our rivalry with georgia on the gridiron, I wanted to re-post this article I wrote a year ago, that better explains a few things to our rivals as to why we bother with all of the hate that they just don't understand. If Harrison Butker's instantly legendary* 53-yard field goal as regulation time expired had been another foot-and-a-half shorter, Georgia Tech wouldn't have really been able to complain about having lost to Georgia. Option teams that have first-and-10 in their opponent's territory with four-minutes-and-change to play should be able to run the clock out, or at least score the field goal that would guarantee overtime. We learned plenty in the final weekend of the regular season. 1. Unbeaten ACC. The ACC went 4-0 against its SEC counterparts on Saturday, its first sweep on rivalry weekend since 2000. SEC apologists can spin the sweep any way they want -- but it was against the dreadful East! Here are some quick thoughts on Georgia's shocking overtime loss to Georgia Tech, 30-24. What it means: Georgia's five-game winning streak against Georgia Tech is now over as the Yellow Jackets prevailed. With how this game ended, it's certainly some more salt in the wound for the 'Dawgs, especially after missing out on the SEC Championship. In a day where it appeared Georgia Tech's fate was sealed again in crushing fashion, the Yellow Jackets pulled off a wild one in Athens, 30-24 in OT over the Georgia Bulldogs. In a first half where Georgia's running game seemed to dominate, the Bulldogs couldn't punch it in the endzone to finish drives. 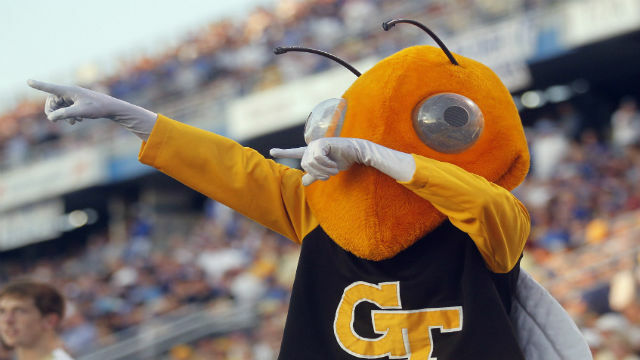 For just the second time in 14 years, the Georgia Tech Yellow Jackets have defeated the Georgia Bulldogs. Behind a dominant performance along both the offensive and defensive lines, a resilience in overcoming mistakes and a little good fortune, Georgia Tech ended (at least for now) Georgia's run of dominance, and in doing so picked up its 10th win of the regular season. No. 16 Georgia Tech rolled up 463 yards and beat No. 9 Georgia, 30-24, in an overtime thriller Saturday. #SwarmStats takes you inside Tech's 10th win. The Historical Nature of the "Kick heard 'round the State"
Harrison Butker propelled Tech in to Overtime with a 53 yard field goal. The longest ever made field goal by Tech was in 1986 by David Bell, 1982 by Ron Rice, and 1973 by E.O. Whealler (55 yards). Tech has only attempted 15 kicks of 55 yards or more missing all other attempts. Georgia Tech | 9 takeaways from Tech-Georgia, The Anatomy of Hate, Upset confirms: yeah, Georgia Tech's pretty Dawg-gone good, What we learned in the ACC, Rapid Reaction: UGA blows lead in final 18 seconds, loses to GT in OT, Georgia Tech Wins Wild One in Athens over the Georgia Bulldogs, BZZZZZZZZZ, Georgia Tech vs.
Georgia Tech radio call of the game-tying field goal and game-winning interception in Athens on November 29, 2014. Audio from the Georgia Tech IMG Sports Network with video from the SEC Network.